A cheap digital watch can keep far better time than even the most complicated of Swiss watches. But there’s still something undeniably appealing about watching all those gears, springs, and cogs spinning about — and this incredibly complicated clock that writes out the time has them in abundance. 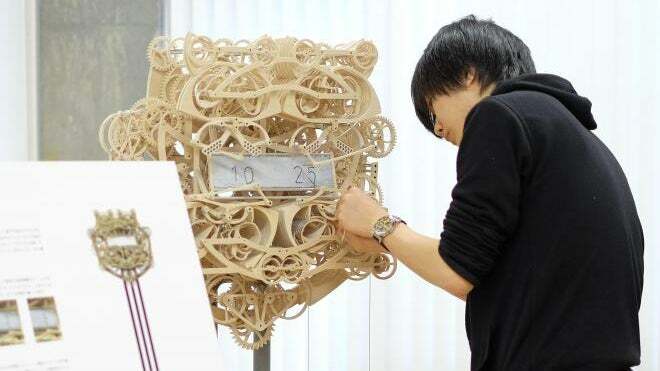 Designed, engineered, and built by students at the Tohoku University of Art And Design in Japan, the clock uses upwards of 400 wooden components to manipulate four arms that write out the time every minute. The clock’s display appears to be nothing more than a cut down Magna Doodle toy, which can be easily erased before the four magnetic pens update it 60 times every hour. A definite improvement to the whiteboard and markers we’ve seen used on other writing clocks which get dirtier and dirtier every minute.